My nine-year old daughter made these blueberry muffins for us this morning. She did it all by herself. They are delicious and each one contains nearly a whole serving (one half cup) of healthy fruit. What a perfect Valentine’s Day treat. Cooking healthy, nourishing food for people is an act of love and I am happy that someday she will be able to whip these up without the recipe and continue to share her love with others. Thank you, sweet Anneka. I love you! Preheat oven to 350 degrees. Put paper muffin cups in a tin. In a bowl, whisk together the flour, wheat bran, baking powder, baking soda, and salt. In another bowl, whisk together the sugar, honey, yogurt, oil, eggs, and vanilla. Fold the dry ingredients into the wet until combined. Fold in blueberries. Scoop batter into muffin cups. Bake for 25-30 minutes. 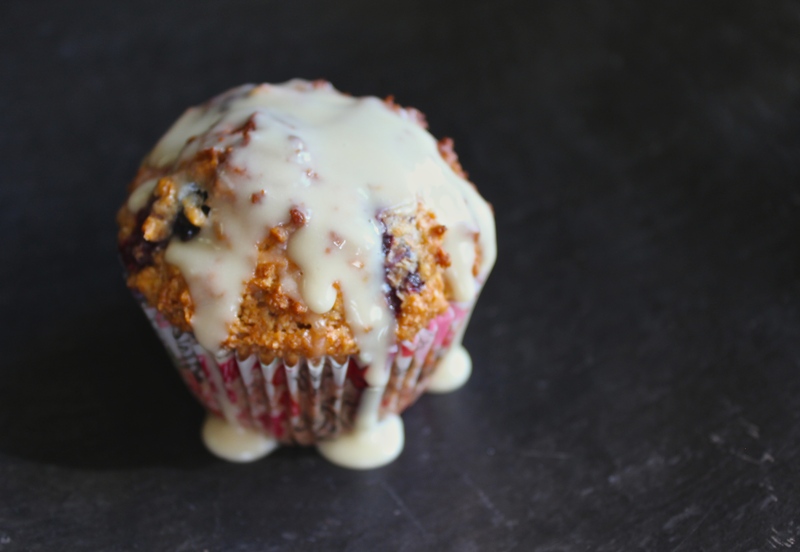 Combine maple syrup and confectioner’s sugar and then drizzle over muffins. Notes From Day 10/365 :: Eating more produce has become easier as more of my friends and family members get involved in this five-a-day project. Are you talking with people about eating enough fruits and vegetables every day? What are their favorite tips? How might you support one another. Did you enjoy your daily five?